A new study reveals that 90% of Kenyans have seen or heard false news about the 2017 general election, with 87% reporting instances of deliberately false –or fake– news. The popular social media platforms like facebook and whatsApp have become the preferred channels that propagate ‘the alternative facts’. 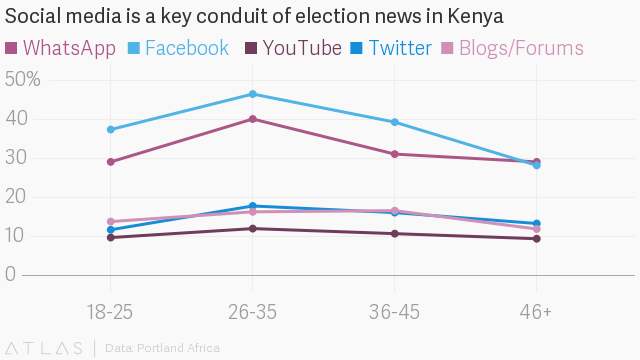 The study by Portland and GeoPoll named, The Reality of Fake News in Kenya reports that Social media is widely used by Kenyans of all ages to access and s hare news, with 49% of Kenyans using social platforms to secure general election news. However, social media consistently ranks lower than traditional media on trust. In the past, false stories were used to peddle narratives about the death of showbiz celebrities, the import of plastic rice into Kenya, the dangers of certain online games, or the appearance of Barack Obama’s Kenyan birth certificate. But observers now say there’s a concerted attempt at spreading misinformation and to perhaps sway public opinion. As the campaigns have gotten underway, there has been an increase in the number of attack ads appearing online, besides the manufacturing of falsehoods disguised as news material. This process has now become a core part of the news mix in Kenya, according the study which revealed 90% of Kenyans had heard or seen false stories related to the election, with a cross section of the population including official groups, friends, and families all using social media to spread misinformation. The study had asked a sample of 2,000 Kenyans about their consumption of news related to the upcoming polls. “While fake news is evidently now a core part of the news mix in Kenya,reassuringly, our study found that Kenyans are already well attuned to spotting false information. Respondents cited conflicting data, controversial messages and biased reporting as the top factors that lead them to suspect something is false. Getting even more sophisticated about spotting and tackling fake news will be vital in ensuring that credible news sources can maintain levels of trust. Almost 50% of those polled said they used social media to access and share news about the election. But despite their pervasiveness, respondents didn’t fully trust information shared on networks like Facebook and WhatsApp. Mainstream media outlets like television, newspapers, and radio were rated as more trustworthy sources.